Acedia and its Discontents: Metaphysical Boredom in an Empire of Desire. R. J. Snell. Kettering, OH: Angelico Press, 2015. Acedia and its Discontents is wonderful book to understand the modern condition that afflicts the West today. Written in an accessible style, while still maintaining high academic standards, Acedia and its Discontents follows in the tradition of Josef Pieper of providing a theologically-minded and philosophically rigorous book that both specialists and non-specialists can read. For those who are interested in what underlies modern man’s present discontentedness, this book is a must read. The book consists of three sections with two chapters each as well as an introduction and conclusion. 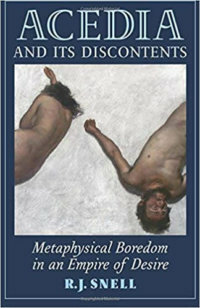 The first section, The Weighty Gift of Responsibility, presents a religious philosophical anthropology; the second section, The Unbearable Weightiness of Being, examines acedia as the cause of the modern manifestations of boredom, nihilism, and consumerism; and the third section, Lovely Resistance, offers an antidote to this malaise. Unfortunately, there is no index, but there is an extensive bibliography for the reader to consult. The first chapter, “From the Dirt, for the Dirt,” is an account of a religious anthropology in which humans seek their perfection by operating and communicating in relation with others by giving themselves, as they are created in the image of God. Complementing giving is work which is not a curse but a blessing that allows people to discover and perfect themselves while transforming the world. Thus, humans are “from the dirt, for the dirt” because God has given them a responsibility to govern the earth, a task for which their personhood appears unique when compared to other animals: “We who are the very stuff of the soil, carry a responsibility that soil does not, and this responsibility is conveyed to us in the mandate to work that same soil” (31-32). Work is a redemptive act where people are able to discover their integrity as a person. Exploring this notion of work as a redemptive act is the subject of the second chapter, “The Great Economy.” According to Snell, good work “enriches our own subjectivity as it contributes to the bettering of the objective world,” as contrasted with bad work which “sickens the world and ourselves, perverting our lives” (36). To distinguish between these two forms, Snell provides three tests: 1) respect for the integrity of things; 2) respect for the integrity of systemic emergence; and 3) proper direction. The first test assumes that things of the world “possess status, that they have weight and logic of their own, and that our work is to act in keeping with the capacity of things” (42). The second test is to recognize that things of the world are interconnected with one another – “everything is in relation everything” – and therefore asks people to be humble in our attempt to know how things works. The third test is to acknowledge that humans are dependent upon God and therefore they need to make a home for God in their lives as God has made the universe for them. Chapter three, “Hating Being,” examines acedia and its transformation into boredom and nihilism into contemporary culture. Acedia reveals “a hatred of place, work, and life itself” and “manifests itself in the external instability of movement and departure” (63). This revolt against the order of being results in disgust and sadness which cripples a person from doing good work. This inaction leads to boredom, whether being bored with something, boring oneself with something, or being bored by boredom itself. The first two types are characterized as one being bored by the emptiness of objects, situations, and activities, while the third type is when one is bored by everything. It is this third type of boredom that leads one to nihilism, a hatred of oneself and the universe. The next chapter, “Bleaching Things,” contrasts the acedia view of the world with the religious one. In the latter individuals and things are considered gifts and consequently have a dignity and integrity inherent to them. Whether it is food, philosophy, or sexuality, these activities are both good and true according to the religious perspective. By contrast, the acedia view strips them of their inherent meaning and sees them as a type of commodity that can be consumed as one desires. Drawing from the works of Josef Piper, chapter five, “Sabbath Work, Sabbath Feasting,” looks at Pieper’s suggestions of how to cure acedia. According to Pieper, one must first affirm the goodness of the world as God does and then affirm one’s own being and to work in keeping with one’s responsibilities. To do this, leisure is required: the celebration of the goodness and truth of the world in divine contemplation and festivity. In leisure, we reaffirm our status “as subjects, created in the image of God and endowed with the dignity of conferring gift”; “the responsibility to see the goodness of things as God sees goodness”; and “that all our life and actions and work exist primarily for their subjective end even as they develop the objective good(s) of the world” (108). The last chapter, “Small is Beautiful,” shows how people can practice divine worship in their everyday lives. One such way is to practice the virtue of magnanimity but not as understood by the Greeks as revolving around great honors. Instead magnanimity should be about ordinary work as a difficult and good task, for it is the realm of the ordinary that redemptive acts of love transpire between God and humans. Spirituality is not something exotic or mystic but the incarnation of God’s grace in the ordinary. It is the grinding away at the daily difficulties of life where friendship with God becomes possible in the hope of being much fruit. By contrast, the slothful stays until his or her desires are temporary satisfied, only to leave disappointed and empty, wishing “for a new work in a better place” (123). Often mistaken for laziness, acedia is actually a rejection of the order of being that results in frenzy and pointless activity that can overspill into violence and destruction. The modern project is a manifestation of acedia where moral frameworks and their limitations are discarded, leaving the modern person only with desires that can never be satisfied. The outcome is a life of emptiness, boredom, and malaise. Acedia and its Discontents provides us not only a dissection of this modern, nihilist condition but a possible way to come out of it.